Once we got our fill of the Perito Moreno glacier, Cédric and I decided to get an early start on our way into Chile so we left El Calafate that afternoon. Since it had rained the night before, the border dirt road that we wanted to take was most likely impassable forcing us to drive more southward. In the small town of Esperanza, we picked up a hitch hiking duo also making their way down south. 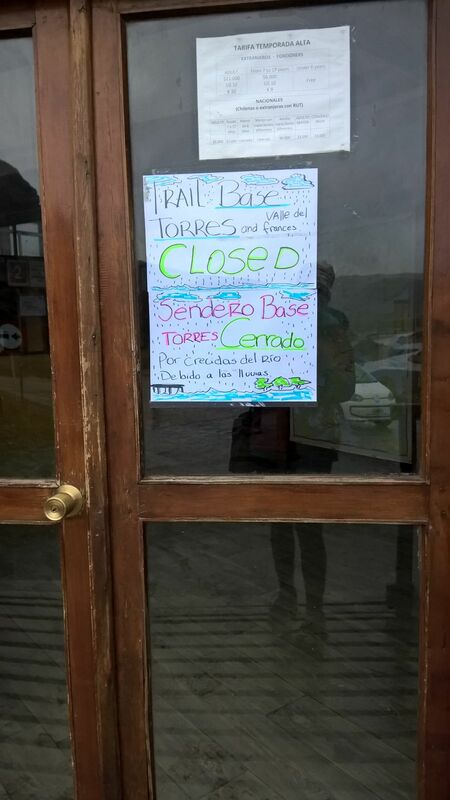 Having connections in the city of 28 de Noviembre, they mentioned that the coal miners were striking, so the border town of Rio Turbio might be impassable as well. And it was. That evening, while eating the most expensive hamburgers of our life in the most unappealing of towns (28 de Noviembre), Cédric and I decided to try our luck with the third border crossing. Thankfully, it worked. With the help of our GPS, we can found the stationed Argentinian border crossing 20 km down an unmarked and unpaved road, with the Chilean crossing 5km further down the road. That night, we arrived in Puerto Natales just before the rain. The next day in torrents of rain, Cédric and I wandered through Puerto Natales in hopes to gather enough money, food, and information for our stay in the Torres del Paine National Park. Gathering information was no easy feat, since it seemed that there was a lack of communication between multiple entities for this highly regulated park. One could not simply camp in a designated camping area as in other places where we had been… we found out that booking (and paying for) a spot needed to take place weeks/months in advance, which sometimes included an overpriced full board. Pity for those who were unlucky with weather. Since we had a car and were more mobile than most visitors who took busses into the park, Cédric and I opted to camp off the trail and drive to trail heads every morning. Although it wasn’t the hike that we were hoping for, we were making due. After a hearty Chilean stew at a local restaurant, Cédric and I drove to a campsite just in front of the rangers’ office to get an early start for hiking. By this time the rain had not let up and we were the only people at the site, so Cédric had the brilliant idea of sleeping in the bathroom. For those also camping in similar conditions (a cold downpour), this option comes highly recommended. The next day, we woke up dry and made our way to the rangers’ office only to find out that the trails leading up to the main view points were closed. And had been closed the day before as well. From the period between early agricultural settlements and up to the late pre-Hispanic period, northern Chile was a region of Andean culture that was influenced by altiplano traditions spreading to the coastal valleys of the north, while southern regions were areas of Mapuche cultural activities.